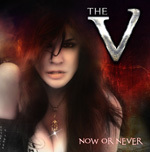 The V, as she is affectionately known, is Veronica Freeman. You probably know her best as the lead vocalist for California metal band Benedictum. She breaks out on her own, but not alone, to release her first solo album, Now Or Never, which was financed in large part by fans through a Kickstarter campaign. When saying she's not alone in this endeavor, Freeman had the support of some heavyweight players in the hard rock and heavy metal biz. 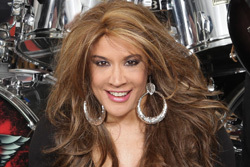 Besides her band mates from Benedictum, other players include Michael Sweet (Stryper), Garry Bordonaro (The Rods), Jeff Pilson (Dokken, Foreigner), Mike Lepond (Symphony X), Tony Martin (Black Sabbath), Leather Leone (Chastain), and Jerry Dixon (Warrant). And that's the short list. Of course, the focus is upon Freeman's voice as she demonstrates her range from classic hard rock to heavy metal vocals. In this sense, and somewhat musically speaking, this album is a departure from Benedictum's heavy metal, but not all that far. From the start, you'll find songs with a metal edge with Again. Later, there's the riff rumbling monster of Spellbound and speed rush of Ready To Run, both burning with traditional heavy metal spirit. Yet, in the middle of the album Freeman gives you a taste of more melodic hard rock. L.O.V.E. and Line In The Sand put an emphasis more upon beat and groove, having more present liveliness. She also dials things back at times. Love Should Be To Blame moves a bit slower, more intentionally, with the music and groove riding below, but not too far below, Freeman's voice. Perhaps a bit more subdued is Starshine, at least at the start, then turns into a melodic metal vocal anthem, again with Freeman leading the way. Kudos go to her players. There are bunches of knock out and stirring guitars solos. And those musicians backing her up via the rhythm section are tight and steady. Probably the only drawback some might find is that Freeman didn't steer far enough away from her heavy metal roots. Nevertheless, I'm sure Freeman had a vision for what her first solo album might sound. For the tunes, the melodic metal and her always strong and melodic voice, it sounds pretty darn good. I hope it exceeded her expectations. Recommended. Benedictum vocalist Veronica "The V" Freeman delivers her first solo, and its jammed packed with melodic metal and her soaring vocals.